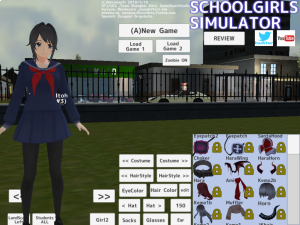 School Girls Simulator is a free-to-play game where the player experiences the life of an anime school girl in Japan and includes attending class and developing relationships with other students. The game currently does not have a plot, the player simply has fun attending class and enjoying the city attractions such as the shrine, the beach, and snowboarding in the icy mountains while trying to complete Mission Objectives to earn rewards from the principle of the school. Their is also an option to fight zombies, the objective in this mode is to protect classmates from zombies who will spawn in campus. • Tomoka Itoh's classroom is at the end of the second floor main gate side. • Tomoka Itoh's locker is the most back from the shop at the locker room. • Change clothes can be done in locker room or Setup or myhome. • When you get tired, your emotion decline and your walking speed slows down. • When you get hungry, your emotion are reduced and the walking speed slows down. • When it becomes impossible to move, it can be avoided by moving the location of Setup. • When you can't sit, someone is coming to sit there. • If you stop walking or sitdown, your power will recover gradually. • If walking is troublesome, you can move instantaneously from Setup. • HP will recover when you take a bath. • To put up with a toilet will reduce emotion. • (Y) message 'Follow me' command make everyone follow you. • '(R) Fly' keeps pushing and fly keep raising. • You can ask him/her out if your evaluation to the partner exceeds 50. • Evaluation gradually returns to 0 every hour. • Lovers get mad when confessing to a different person in front of them. • Lovers relationship will be resolved when evaluation falls below 0. • Love confession is possible for both sexes. • In the state of lover you can kiss even if each other's evaluation is low. • Heartmark will appear if the rating for a favourite person exceeds 150. • Pumpkin gets $0.5 when handed to the shop clerk at the shop. • Asking him/her out is easy to succeed as much as you are loved. • Evaluation increases if you give sweets to classmate/teacher. • If you hand sweet or drink to shop clerk, you give $0.5. • If you are in trouble with money, find out Cauldrons and Pumpkins and try cashing out. • The Cauldron gets $1 when given to the clerk at the shop. • Cauldrons and Pumpkins are hidden in school and surroundings. • If you use Cauldron, you can restore human from zombie. • The broom wipe the blood and increase the flying speed. • Even if the teachers die it will revive the next day. • The bat and the chair can not get angry by the teacher even if you swing. • Even if a murderer can not be seen by a teacher, the student who watched goes to report. • Enable 'Join Club' when speaking to the club leader. • Club activities time, you can kick and play the ball with the tennis club members. • Club activities time, you can kick the ball with the swimming club members and play. • When you quit from club activities you become independent. • BMG volume can be adjusted from 100% to silence. • Camera rotation sensitivity can be changed by Setup. • This game equips virtual reality mode. • Xbox 360 game pad can also connect and play.